Celebrity Gossip and Entertainment News: Khloe Kardashian Considering Reconciliation with Lamar Odom? Khloe Kardashian Considering Reconciliation with Lamar Odom? Khloe Kardashian may give estranged husband Lamar Odom another chance. Khloe Kardashian had a tough time last year – after allegations that husband Lamar Odom both cheated on her and was battling a serious drug addiction, she started divorce proceedings in December. But heat has learned that Khloe is actually thinking of giving her marriage a second chance. “She is going to call off the divorce and wants to take her time to see if they can make it as a couple again,” an insider tells heat. But a reconciliation isn’t something that Khloe’s momager Kris Jenner and her sisters are happy about. “They’re trying to show her tough love by saying they won’t entertain Lamar bring back in life again,” the source explains. Sounds like 2014 could be just as tough for Khloe. I guess that means they can only have one token black husband in the family and the current sucker is KW. They use this men like toilet paper and just flush them when they are done. Oh wait.....men have been doing it to women for years. Rabbit got the gun now. Rabbit got da gun now, LOL!!! 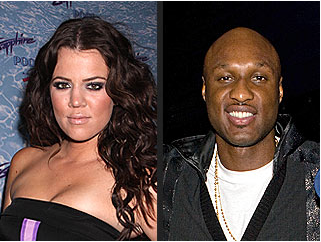 But seriously, Khloe and Lamar look like two ugly men, like some damn poster for gay marriage.